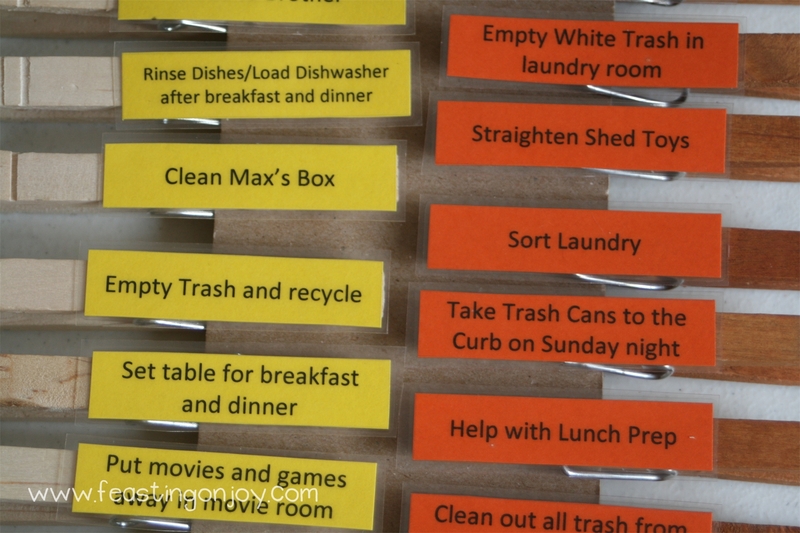 I am so excited to tell you about our new chore system! I would like to give you great detail so I broke this topic up into two posts. This first post will be about how the chore system works and the second post will talk about our family guidelines that go along with the chore system as well as the blessings and consequence system we use. Our family chore system needed an update. My poor oldest son had been doing virtually almost the same chores for 3-4 years! While he was so patient and diligent about it he was starting to get weary (and bored) and needed to be refreshed. He was up for new challenges and my youngest was up for more responsibility. I was also frustrated with the feeling of constantly micro-managing what my kids were getting done and I felt that the responsibilities among the boys were imbalanced. I was getting weary with the way it was going. I had been praying for a while about changing our chore system. I was asking the Lord to lead me in the right direction because I didn’t want to set something up and have it fail or do it all in my own strength. He knows my kids best and me best which means He knows how to direct me best. My husband and I were at our homeschool conference in June (I recommend everyone who homeschools or is thinking about homeschooling attends these once a year, they are so encouraging and renewing) and we came across a lady who had a very well organized home with an abundance of kids. After looking at some of her material I knew it would be a jumping off point for creating our own chore system. Life is school right? I certainly think so. We spent an entire week teaching life skills to our boys and training them on our new chore system as well as our expectations. It has really paid off as we are a month into it now and I am feeling like I am working myself out of a job. Yay! Sure, I will always have chores to do but they are capable young boys and can certainly pull their weight around here – and they do. The left side is my youngest son’s board. 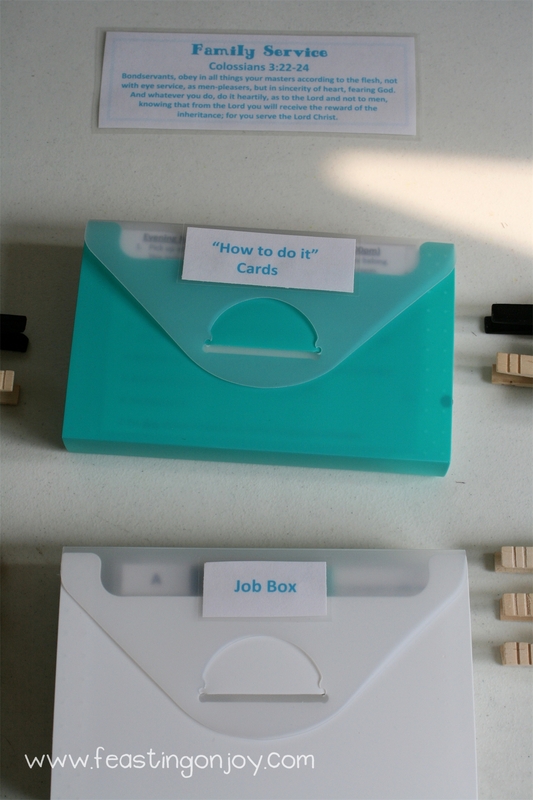 The middle is our Family Service verse – Colossians 3:22-24, “How To Do It” card box with the “Job Box” and the right is my oldest son’s board. This system works with more than two children as well. I purchased the teal boards at Target in the dollar bin. They are magnetic and came with the little flower magnets. I covered the magnets with what I wanted them to say – “Daily,” “Weekly,” and “Monthly.” I also purchased the middle organizer boxes at Target in the office supply section. They have worked out perfectly. The clothespins were purchased at Hobby Lobby and I didn’t intend to do different colors for daily, weekly and monthly chores but Hobby Lobby ran out of clothespins (the ones I needed) so I had to improvise. I like it better this way anyway. 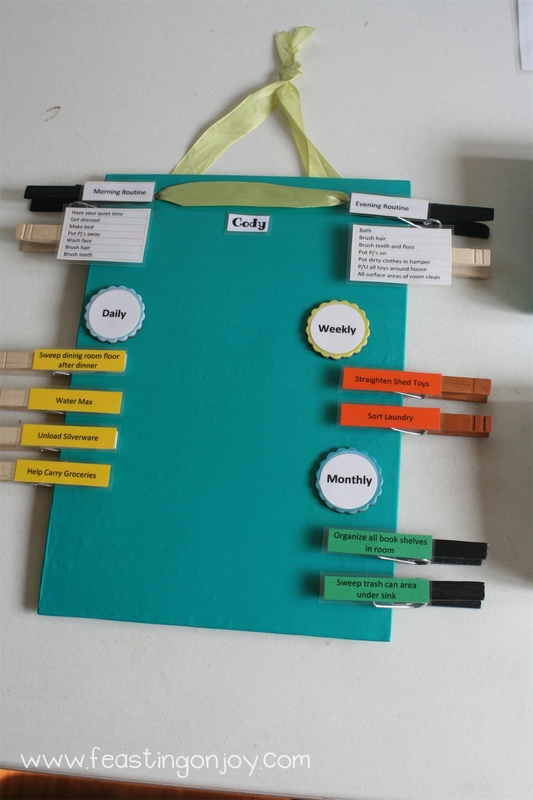 You can create your system in a similar way by going to the craft store to find your supplies. 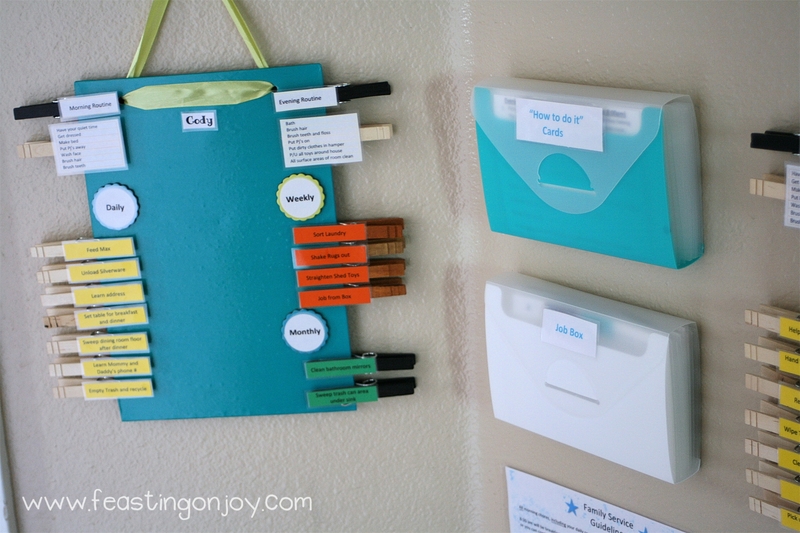 We chose to hang our system up in a prominent place that the boys will always be able see and access their charts and boxes to keep up with their responsibilities. I wanted to show you a close up of both boards. On any given month the kids will have around 13 tasks to complete so what you see in the picture is a little sparse on the amount of chores I give them. They are of course age appropriate chores too. You would be surprised what your little ones can do! The chores on the morning routine are: have quiet time (we don’t consider this a chore but it is a good reminder for the boys each morning), get dressed, make bed, put pj’s away, wash hands, wash face, brush hair and brush teeth. The evening routine is: take a bath, brush hair, brush teeth and floss, put pj’s on, put dirty clothes in the hamper, pick up all toys around the house, and make sure all surface areas of your room are clean. These will probably also change as they get older. For now though the evening and morning routine do not rotate each month. The rest of ALL the chores rotate each month. For example the boys will have different daily, weekly and monthly tasks for October than they did in September. This helps them with boredom and helps me train them in all the chores not just certain ones. Even though they will grow up to be men they need to be capable to cook and do household tasks such as cleaning and keeping things orderly and so those jobs are included in the chore system. It will hopefully greatly bless their future wives and will give them skills they need if they don’t get married. Daily Chores are things like sweep dining room after dinner, give water to the cat, empty the trash, help carry groceries, unload silverware, etc. These are things that almost always need to be done daily in our house. The weekly ones are things like sort laundry (yes we only do laundry ONE day during the week), vacuum couches, fold and put away laundry, etc. The monthly chores are things that need to be done but not as often like sweep the front and back porch, mop the floors, organize book shelves, sweep in trash area under sink, etc. 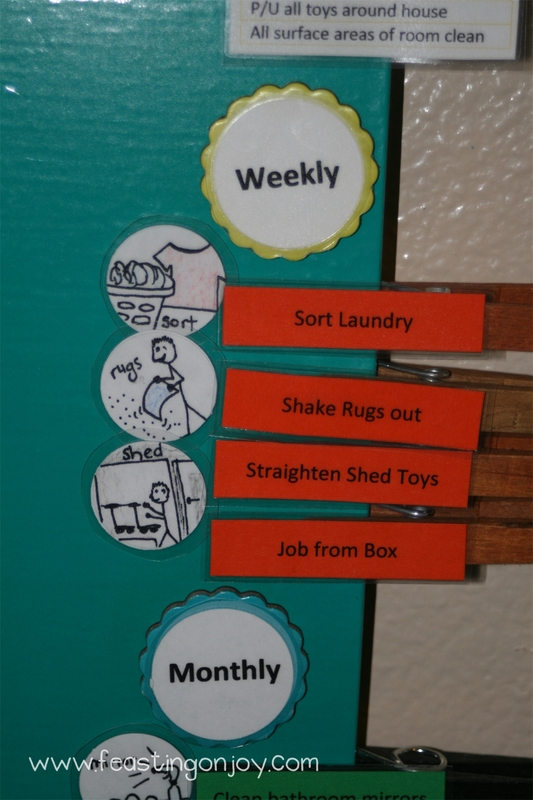 Each week the boys also have a weekly clothespin that says “Job from the Box.” This means that they get to choose a job to do from the white “Job Box” hanging on the wall. It is to be done on Friday or Saturday when we do our weekly chores. The “Job Box” jobs are things that I consider “spring cleaning” type of chores. 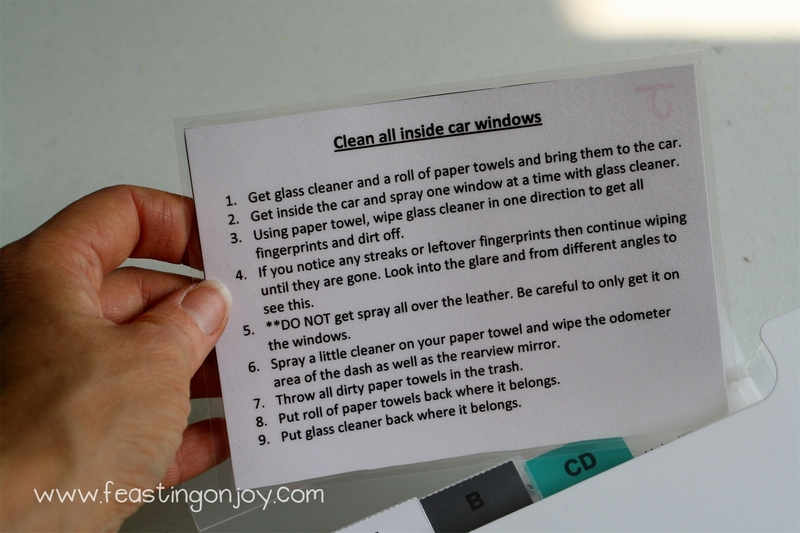 Things like cleaning the front and back glass doors, wiping all switch plates in the house, wiping walls and baseboards. They really like the “Job Box.” Not because they really like the chores but because they really the surprise element of not knowing exactly what is in it and what they’re going to be assigned. This can also be used a disciplinary tool because even though they like the job box they don’t always like to do what chore has to be done from the job box. I can assign them an extra job if needed. My oldest son was so excited when he got to choose the first job out of the Job Box. His smile quickly turned into a frown when he chose clean ALL trash cans inside and out! Awwwhhhh. I am such a mean mom. Actually we helped him with that but it was a doozy. It needed to be done and all hands make light work. If you’d like you can make the task from the “Job from the Box” a monthly thing rather than a weekly thing. Let’s talk about the clothespins. Here is a close-up of what those look like. 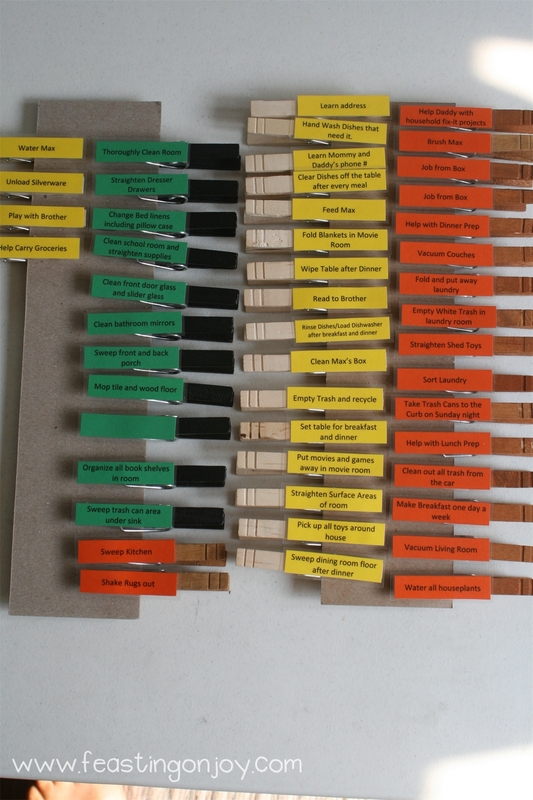 These are laminated, colored cardstock glued onto the color coded clothespins. I store the extra ones that are not in rotation on the magnet boards on pieces of scrap cardboard and those go in a magazine file that sits on my book shelf. First we will start with the “How to Do It” Cards. These are basically step-by-step instruction cards for each chore we have in our home. They are reference cards. I am pretty particular about how things are cleaned here and want it learned “right.” If they can do a thorough job and want to do that thorough job in their own way once they have learned my way then they are free to branch out a little. For life skills week (the first week of school) we went through a good portion of these cards and each chore to train them of what I expect for each chore. 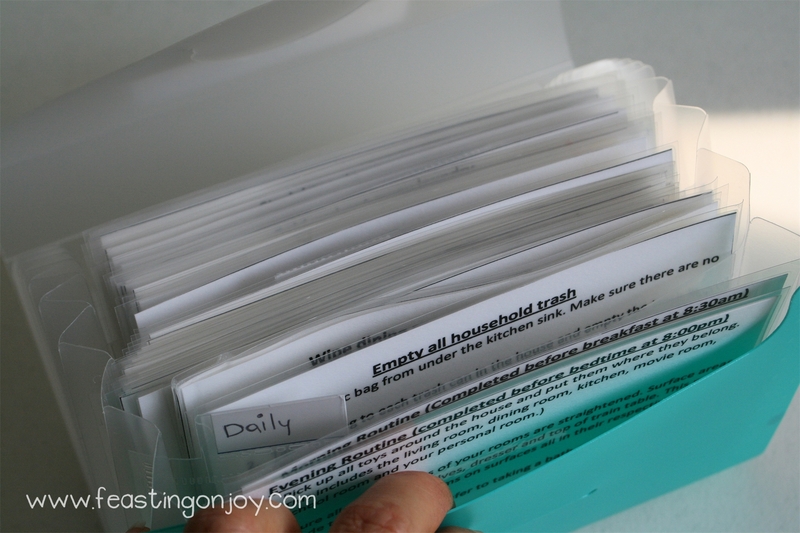 The cards are 4×6 cards laminated and filed under “Daily,” “Weekly,” and “Monthly” tasks. Each set has a “D,” “W,” or “M” written on the back of them in case I forget where each one goes or someone dumps over the file box and mixes them up. It may seem a little excessive at first but our children need instruction. They need to know how and what our expectations are of them. If they are not taught then they will not know our expectations and chances are they will not do a thorough and effective job. 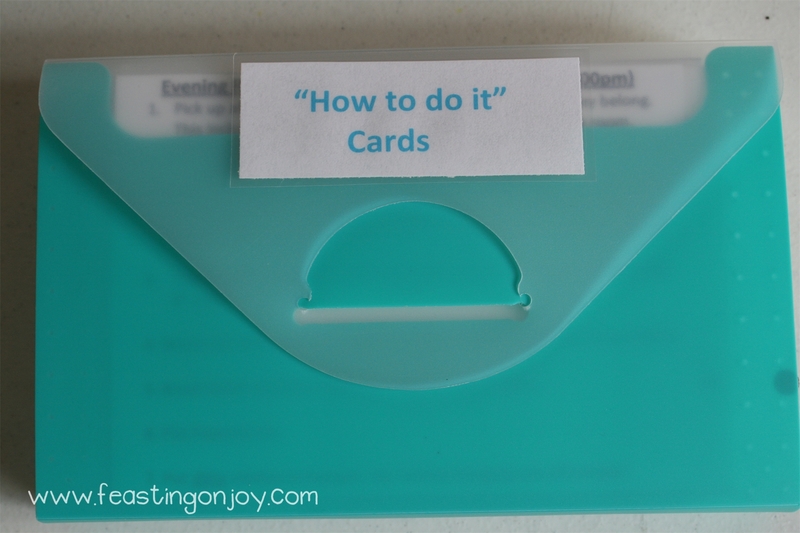 By the end of he second week the boys did not need to refer to the some of their how to do it cards any longer because they knew the expectation. These cards have also helped when the boys don’t do the job properly. They are able to refer back to the card in order to be reminded of the expectation. It eliminates the possibility for excuses as to why it was not done correctly and it eliminates laziness. 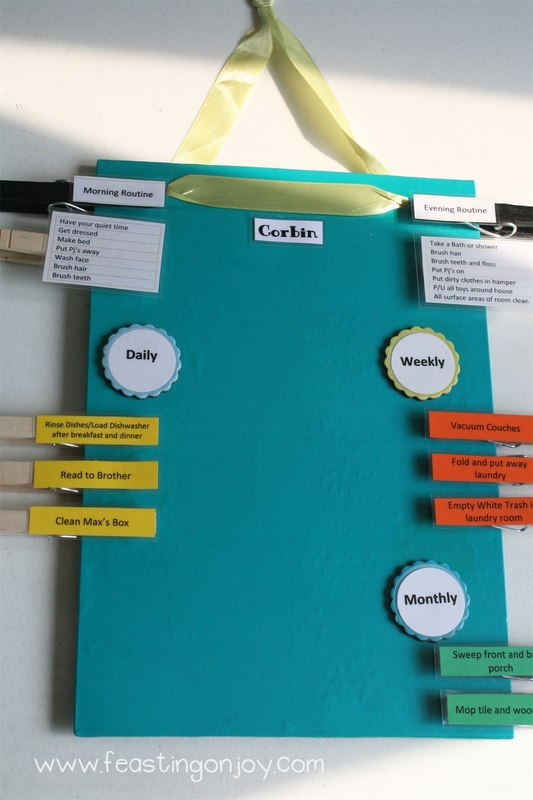 When chores change again they will have a period of time that they will need to start referring to the “How To Do It” cards again to refresh themselves on the newly assigned chores. 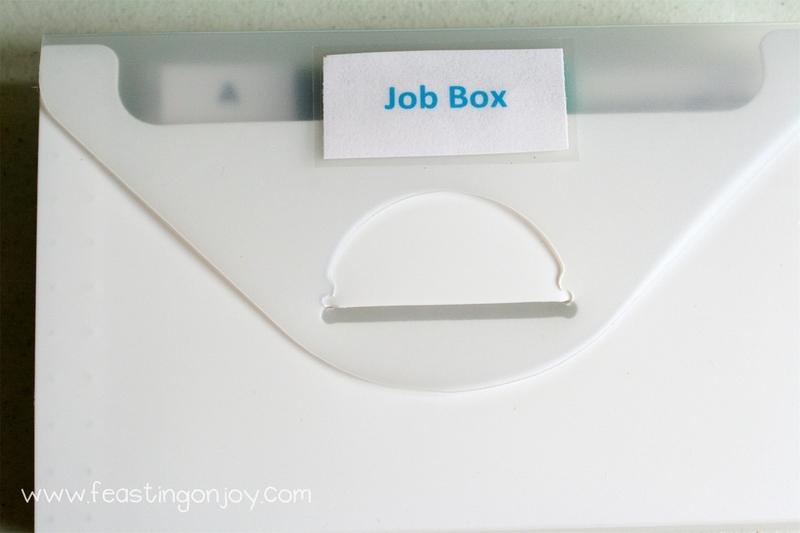 The “Job Box” has less cards in it because it is just jobs that are “spring cleaning” type jobs. Each card in this box is 4 x 6 and laminated as well. These also have a “J” written on the back of them so that I know they go in the job box. These jobs are filed alphabetically in the file box. They are also step-by-step reference cards for the boys to use while doing each chore. I love the idea of clothespins because they are easy to rotate and add to. Each month I will change the boys assigned chores. They will likely have a few of the same but some new ones too. 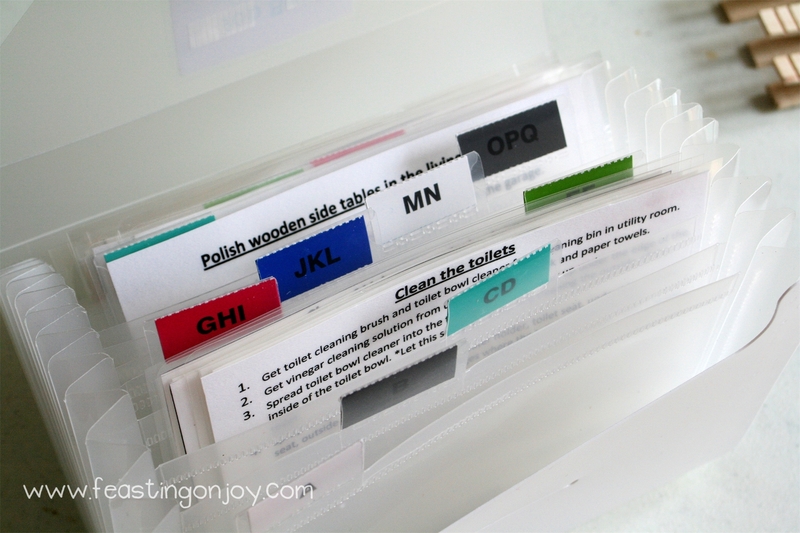 The use of the clothespins make it easy to switch things around and I can easily create another clothespin label if I need to add another chore to our system. The boys are expected to have completed their morning routine but 8:30 AM each morning when we start breakfast. If they don’t, they have a few choices which we will talk about in the next post on family guidelines, blessings and consequences. They have until 5:30pm to complete their daily chores which is before dinner time. There are some daily chores like giving the cat water that have to be done before breakfast and they know that. They also have a half hour to complete any unfinished chores after dinner (like any dishes that need to be done, etc.) If they don’t complete their daily chores by the time specified they have a choice too. We will talk about that in the next post. The weekly chores we complete on Friday or Saturday and they must be done on one of those days or they get some consequences. Sundays are rest days for us. It is not that we don’t have chores to do but our reward system is not implemented that day and it is a bit of a “lighter” day. The monthly chores are done at the end of each month right before rotation on a day of our choice. Since we have boys we think this system will be very effective in raising them to go out and submit to authority (their bosses someday), follow detailed directions and do a successful job using a good work ethic with integrity. We also like the blessings and consequence system because it parallels real life ahead for our boys growing into men. They will one day (like Daddy) go out and have a job where they get paid to do a good work that’s efficient and effective with time management skills. Possibly they will also continue to work without getting paid on the weekends as well. In Part 2 I will talk about blessings. We do not pay our children real money to complete Family Service jobs. It is just that – Family Service. They do have one day out of the week (Sundays) in which they do their work without possibility of blessing (reward), much like a Daddy comes home to his family and continues to work without getting a pay check. I hope that all makes sense. The last thing I am going to quickly talk about using this system for non-reading children. My youngest is not a reader yet and so obviously he can’t read the cards. I decided to draw him pictures for every chore. I still go over the card with him orally and will continue to go over it with him until he does the job according to the card. I also went over each picture and what it meant. He almost knew all of them but my drawing skills have regressed so he couldn’t figure out some of them. Also, for things like setting the table I have drawn pictures on the back of the “How to Do It” card for him to know properly how to set a table. During training I make both of my boys participate in each chore so they know how to do it according to the card. After that, if it is not their chore for the month, they do not have to do it. I hope that it has given you some ideas or inspiration for a chore system at our house. This system has been effective in redeeming the time, easing my need to micro-manage, nag and remind 500 times a day. It has given the boys ownership over their daily tasks and abilities to have blessings or reap consequences depending on what they chose to do that week. It has also helped a great deal in homeschool because we are able to start on time every day (unless something unforeseen happens) and we have been able to enjoy dinner at a certain time. We also usually have an hour to and hour and a half of family time to play or read at night. We are not slaves to this schedule and we do have flexibility but this has created a great guideline for our family and I consider it an answered prayer. Part 2 of this post talking about the blessings, consequences and family guidelines will be up on this week. Stay tuned…. Be sure to read part 2 of the Family Service Chore System. 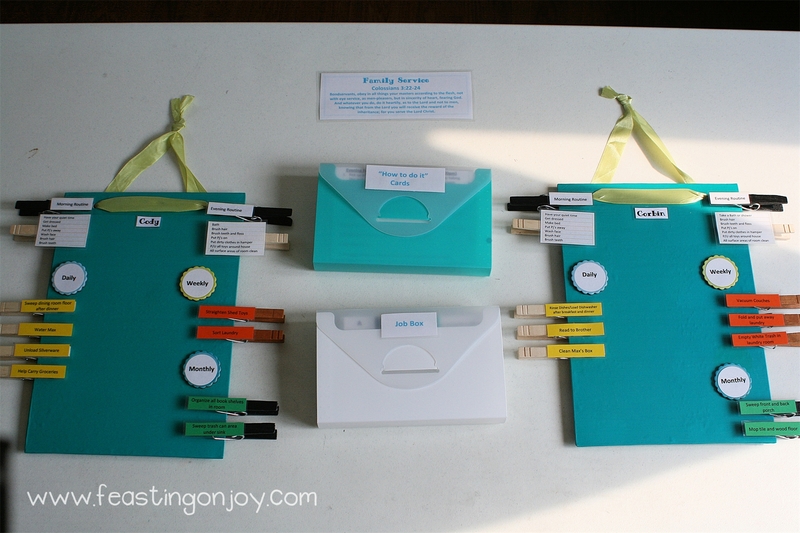 Did you know my Family Service Chore Manager Kit is available for purchase? Click here and you will be able to bring this kit into your home and start your own Family Service! Can you share the Microsoft word files? I am actually in process of formatting the files to post for download on the Feasting On Joy. Keep checking back as it should be early this summer!